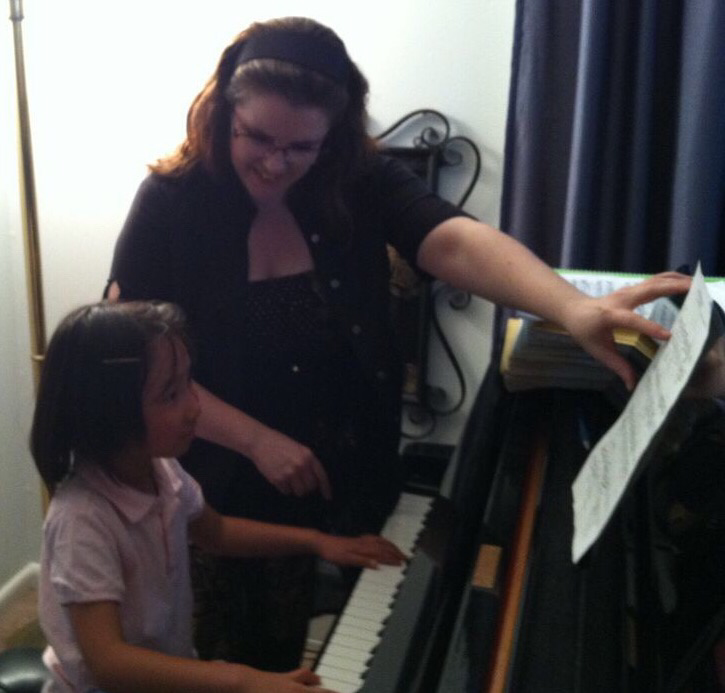 Tara Hofmeister Sheng enjoys teaching young beginner student. From the very first lesson, students need to develop correct habits in terms of reading, technique, and listening skills. It is during the beginning stages that habits are formed, so when students are not taught correctly, it is extremely difficult for them to uno what has been engrained and relearn the correct ways to play and read music. It can be quite challenging (a very difficult and frustrating process). When the only habits that are formed are the correct ones, the learning process is enjoyable and inspiring. I was fortunate enough to learn how to teach young children from Mr. Solomon Mikowsky at the Manhattan School of Music. After teaching me piano pedagogy, I closely observed his lesson with young children at the MSM Precollege Division. Before that I was also fortunate to learn piano pedagogy from Eleanor Nelson of The Juilliard School. ​I love teaching the highest level students such as those I taught at the High School Attached to the Central Conservatory of Music in Beijing, China (中央音乐学院附中) as well as beginner students as young as four years old! I am passionate about working with young children and understand the importance of teaching them correctly from the beginning while inspiring them to love music! I welcome the opportunity to work with students from beginner children, intermediate students, and adult professionals. 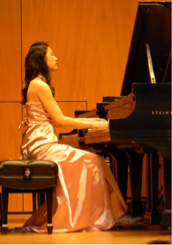 Former student from the High School Attached to the Central Conservatory of China (中央音乐学院附中) performing her graduation recital for her undergraduate diploma. Tara Hofmeister Sheng being sure student's wrist is relaxed while working on finger technique. My musical background is different than most professional pianists and I feel that this actually enhances my teaching. My technical training came later than most, making me much more aware of how to solve technical issues. I have also been very fortunate to learn many different types and styles of techniques since my teachers and great musical influences came from different pianistic traditions from all over the world - Canada, China, Cuba, Europe, Japan, Russia, and the U. S.
In the beginning I was taught by a most inspirational teacher who taught me musicianship and interpretation through deep theoretical understanding with a “safety first” style of technique. Theory is what helps us “read between the notes” and make music, not simply read notes and push keys. ​All of my teachers showed me how to create a range of sounds and colors on the piano by teaching me all aspects of how the instruments works and how to use it to its full advantage. Most importantly, they taught me how to channel my emotions and imagination to create beautiful music. My goal is to share this with every student. 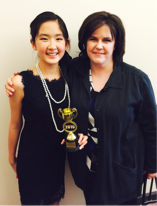 Ms. Hofmeister Sheng so proud of her student after watching her perform her winner's concert at Weill Recital hall at Carnegie Hall. 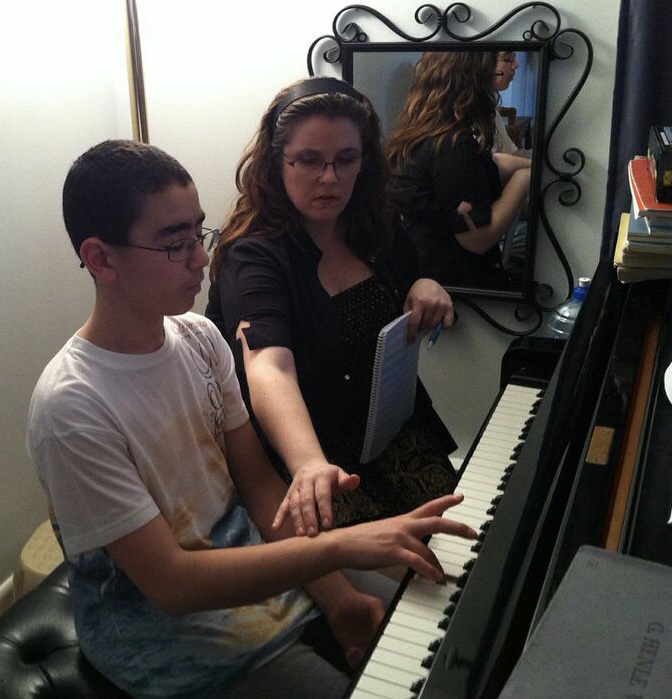 ​When I take on a student, I am completely dedicated to giving each student the best musical education I know how. This is what my teachers did and I love having the opportunity to “give back”! To me, teaching is not simply teaching one or two lessons a week, it is important to keep in contact between lessons. If students have questions it is best that they ask sooner rather than wait many days without practicing or practicing wrong habits. Students can send me pictures of their music and circle the spot with the question and even send me little video clips! 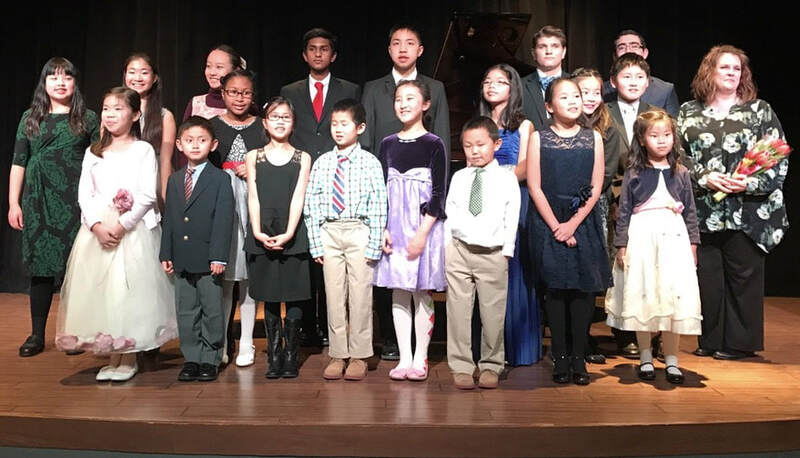 Ms. Hofmeister Sheng's students ages 5 through 17 after performing at the Randolph Performing Arts Center. ​and concerts occur two times every year. 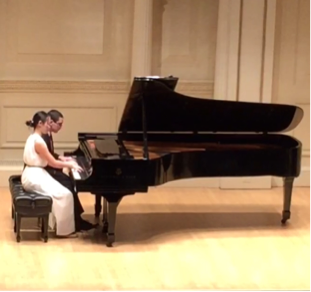 Students performing duo in winners concert at Weill Recital Hall at Carnegie Hall. When music is shared with peers, it is fun and both musical and personal development is much quicker in so many areas. So I always encourage students to play chamber music - to play together with their friends, studiomates, or classmates) as duos, trios, quartets, etc. All students attend performance classes, whether or not they will perform, as it is one of the most valuable tools in music education. 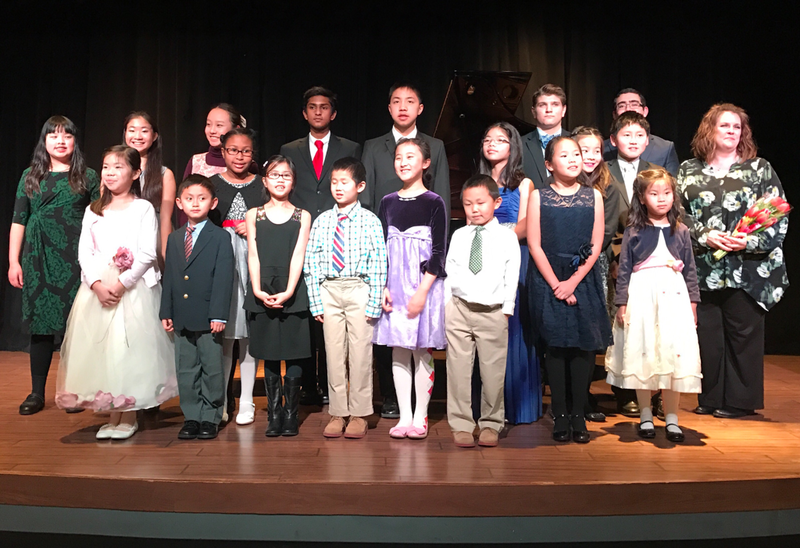 In performance classes, students not only get the opportunity to practice performing and to bring their pieces to another level, but also to develop their listening skills. Performing takes practice, just as training muscles, learning notes, shaping a piece, etc. The more experience we have performing, the more successful we become at expressing ourselves in public. Also, with each performance of a piece comes a new understanding of the piece and shortcomings that were not evident in the studio come clear. All performances are recorded so students can listen review and discuss during their lessons. Performance classes are not only learning experiences for those who perform, but also for students listening in the audience. After each performance, students discuss it by giving productive, constructive criticism to each performer. When students learn how to listen to performances, they learn how to listen to themselves when they are practicing! They also learn how to constructively and productively criticize their playing so that they can be efficient with their practice time.